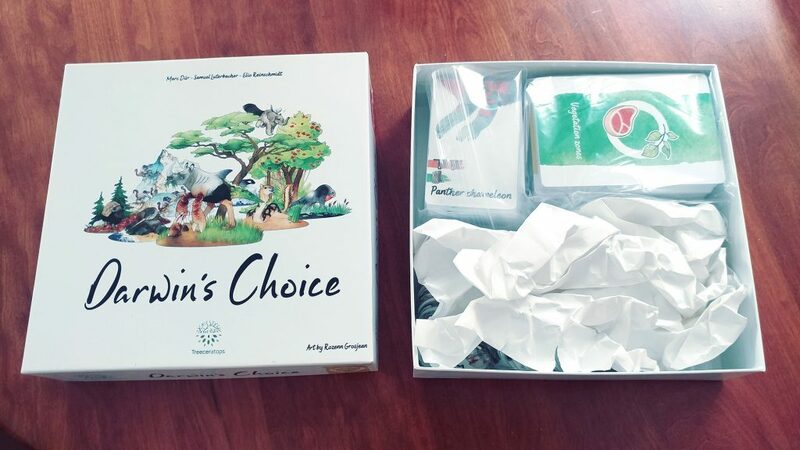 Darwin’s Choice is a card game for 2-6 players that is currently available on a fully funded Kickstarter, with 20 days remaining. 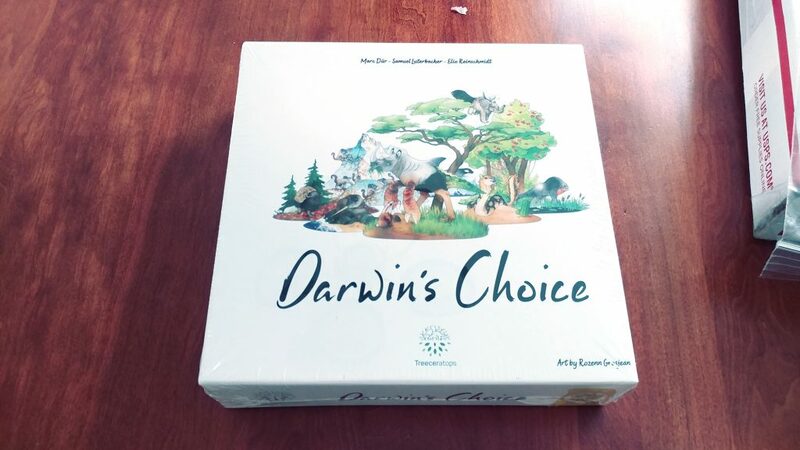 Extinction isn’t in the cards for Darwin’s Choice, but it does play a critical element in the game as you face off with your friends and/or family in your quest to win the most Darwin Points. Let’s back up a few hundred millennia. Players have four rounds to create, mutate, and migrate different animal species in different vegetation zones that appear in the game. Your creatures might die off during the course of a round from not adapting to the changes in the environment, or they might be eaten by a more dominant species. It’s survival of the fittest, and you’re at the mercy of the luck of the draw. By the end of the fourth round, whichever player has the most Darwin Points (awarded at the end of each round) has attained mastery of all things species related! Each player is given 10 animal cards featuring heads and bodies from which they assemble a veritable zoological mishmash of creatures. I wish to take a moment and offer my sheer admiration for the artwork in this game. Each card was beautifully hand-painted by Rozenn Grosjean, and I cannot emphasize just how incredible the art is. You can spend an entire game just shuffling through the cards to look at the art of each, as the detail and care put into it will astound you. 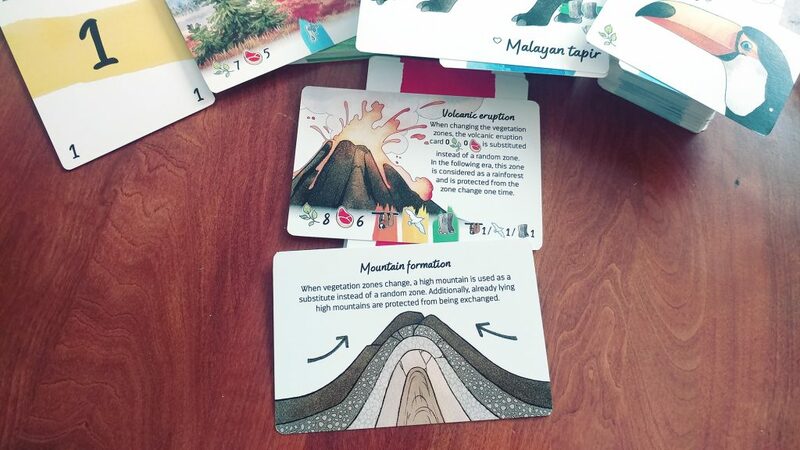 In addition to the animal cards, there are also vegetation zone cards; for each round, the 4 randomly drawn cards will dictate how you will need to adapt your animals. Each Zone has a certain type of food available (meat or plant) and traits animals require to survive in that zone. You place the appropriate amount of food tokens on the zone (I.e. 3 Meat, you put 1 3X meat token). Here I must raise my first, and only significant, gripe with the game. The food and plant tokens feel a bit superfluous. We played a number of games both with and without the tokens, and playing without just felt a little bit smoother to our group. This might not be the same for every group, but the tokens just didn’t work for us. As I’ve mentioned, the game consists of four rounds. Each round, every player has 2 actions they can take, in turn, until you’ve used as many cards as possible. This is a mechanic I always seem to miss in every game; in this case, you’d take a main action, another player would take a main action, and repeat until you’ve exhausted all possible cards. Your first action is choosing to discard and redraw any of the 10 cards you’ve been give from the Animal deck. At first glance, this seemed like a random action with no strategic value. 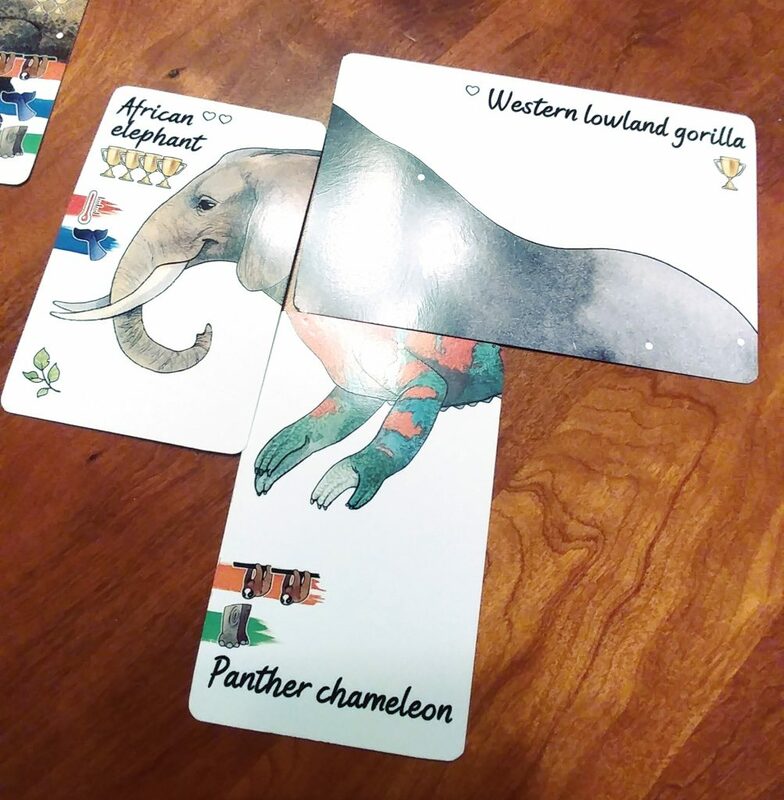 But as we played, the value of drawing, redrawing, and trading with other players became apparent and we began to see how our choices dictated the abilities your animals will have throughout the game. Migrating a species from one zone to another. Building a New Species in 30 Seconds or Less! The core mechanism of the game is building a species. This proved to be far more fun and thought provoking as the game went on, and it gave ideas for new combinations to try in subsequent games (my gauge for liking a game is always thinking ‘How can I play better next time?’). Each creature must consist of a Head and a Body, and the cards are separated into each classification. There are signifiers on the cards where the body would join the head, and some bodies allow for multiple ‘extensions’ as it were; the combinations of creatures you can summon are quite astounding. Whale headed bull frogs with a wing are not out of the question in this game. 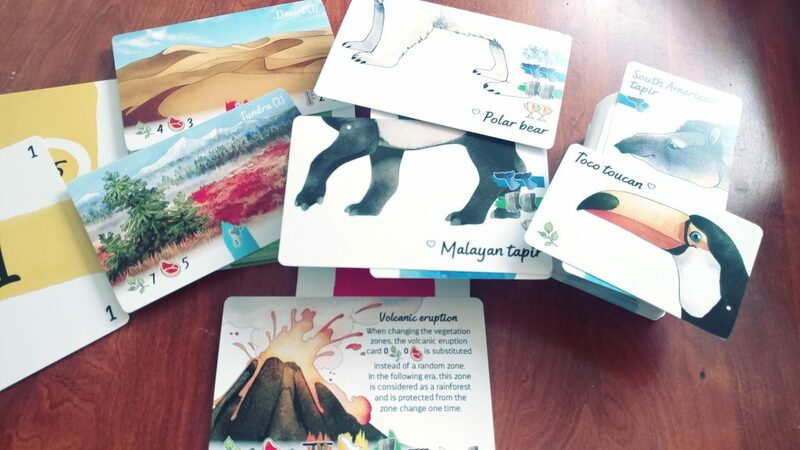 Each card indicates certain attributes the creature possesses (water breathing, tolerance to cold, etc.) and you must bear these in mind in relation to the 4 vegetation zones laid out on the board. There could be an Arctic Tundra or a Deep Forest, and the creature you build must possess the ability to survive and thrive there. It doesn’t help to have a bird-dog that is impervious to heat in an arctic wasteland. Another element on the card is the strength of the creature, represented by a trophy. This comes into play when determining competitive strength at the end of the round. We’ll get there! As we played we each became much more aware of the creatures we were building, thinking ahead to future rounds (although chance often makes fools of such plans) and thinking we each were building the best creature around (nothing’s gonna keep it down!). Let’s just say I call one of my creatures Ted, and that will make what follows infinitely more sensible. This isn’t an action you would necessarily take in the first round, as it is done to adjust your previously made creature to the new zone (if applicable) it’s in. Whereas before Ted was a sea-dwelling creature, Ted may now find itself in a dense forest with no water in sight. So the water-breathing plant-eating traits may not work in this new meat-laden jungle. So what does a master of the universe do? Mutate. You can do one of three mutations: add, remove, or exchange. You’re also able to do a double mutation, but that costs you Darwin Points (which you need to win the game). These are awarded at the end of each round, so you want to utilize these sparingly (if at all). But, if you’ve got a valuable creature that may be killed off because it can’t live in the heat, it may be worth losing a few points to gain more and survive until the end of the final round. Finally, we come to Migration. This will only come into play in the 2nd, 3rd and 4th rounds. As each round ends, the zones your creatures live in will change, and with it the conditions for survival in that zone. If the creature cannot live in that zone, it can migrate to another as long as it can fulfill that zone’s requirements for survival. It’s with this final main action that the tapestry of this game comes into full view; it’s a simple hand management/drafting game that has some very elegant choices interwoven throughout each round. As the game progresses, and you move from round to round, an event card is drawn which signifies a new era. Could be a massive earthquake, or doubling of resources in a particular type of zone; even still it could have a null effect and the next round proceeds without incident. But there’s also the chance of changing the dynamics not in your favor. The zones shift from round to round, and your creatures’ chances of survival thrive or wilt depending on it. There’s a lot to like in this game, but the element of luck (the cards you draw, the zones that are picked, the event that occurs) plays a significant role in the outcome of the game. As someone who prefers zero chance in the games I play, I was a little frustrated by this. However, I found I kept playing because of the sheer fun of creature building; trying to adapt to the new zones and events and circumstances that arise due to the same random chance. At the end of every round, as each zone is resolved; you determine which animal can survive in the zone, which has the greatest strength (and weaker animals are killed/made extinct), and Darwin Points are awarded accordingly. The mechanisms by which you award points is detailed in the rules, and while it’s a bit murky, it’s worth noting the rules have not been finalized and it feels this is something that may change. In that respect, I sort of evolved my own thinking on this type of game. 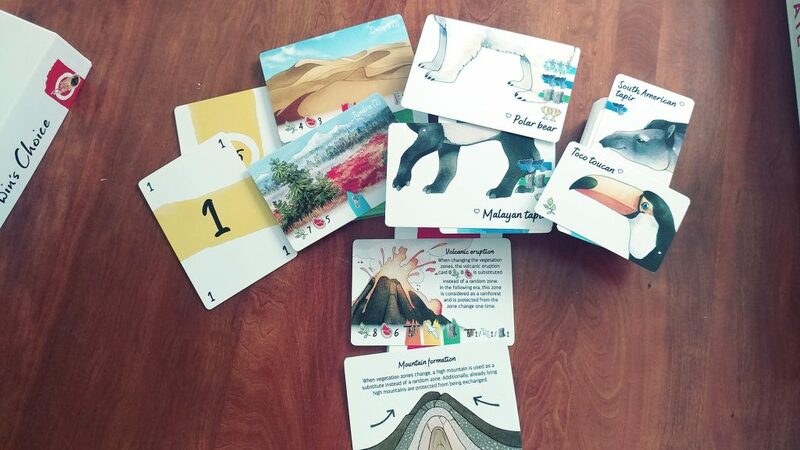 It’s a great family game, good for getting kids’ minds to put together what sort of creatures can live where, and looking at the art and the different cards can spark discussion about what types of animals live where and why. So, if nothing else, it’s a great starting point. It’s a wonderful game that players of all age will enjoy, and I recommend you give this a serious look. Previous postSprawlopolis Review – Is This a City for Ants? Next postCharterstone Review – Greengully Needs You!